People replaced their old standard light bulbs with eco -friendly new generation energy- saving light bulbs, in order to save energy and money. But they don’t know that these energy- efficient bulbs are extremely toxic. According to a research by scientists from the Fraunhofer Wilhelm Klauditz Institute for German’s Federal Environment Agency, if broken indoors, these bulbs release 20 times the maximum acceptable mercury concentration in the air. Consequently, the U.S. Environmental Protection Agency created an emergency protocol you need to follow in the event of a bulb breakage, due to the poison gas that is released. 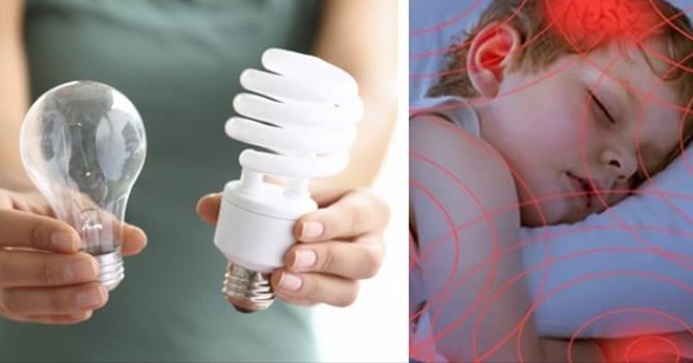 Energy- saving light bulbs contain mercury, which is a potent neurotoxin that is especially dangerous to children and pregnant women. It is especially toxic to the brain, the nervous system, the liver and the kidneys, and it can also damage the reproductive, cardiovascular and immune system. Furthermore, mercury can cause anxiety, insomnia, memory loss, headaches, tremors, cancer and Alzheimer’s. * Naphthalene, a volatile white crystalline compound, produced by the distillation of coal tar, used in mothballs and as a raw material for chemical manufacture. * Styrene, an unsaturated liquid hydrocarbon, obtained as a petroleum byproduct. * Phenol, a mildly acidic toxic white crystalline solid, obtained from coal tar and used in chemical manufacture. The Environmental Protection Agency has laid out a very detailed protocol in the event of a bulb breakage, due to the poison gas that is released..